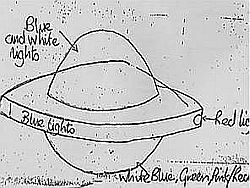 Most of the world on May 14, 2008 was pleased to see the release of basic UFO files by the government of the United Kingdom covering the years 1978 to 1987. Britain’s Ministry of Defence (MOD) had maintained the documents and stated that all their files, dating from the 1950s and covering recent history, will be released to the National Archives over the coming years. Mr. Nick Pope, formerly of MOD (1991-1994), was the first ex-employee to officially state that the ministry was withholding these documents from the public and urging their release. As more and more governments declassify their reports, albeit in a non-committed manner, the consciousness of humanity is being changed as we begin to accept that there is intelligent life beyond earth and that it won’t go away. Official releases began with the Spanish government in the 1970s releasing reports from their Air Force. Russia then released older reports after the change of government in the mid-1990s. Brazil came next with a few key reports later that same decade. Then CNES, the equivalent of NASA in France, in early 2007, and now Britain. This is not all happenstance. The last two major governments to release their documents do so in an era when more and more cities and towns, such as in Mexico and South America as well as in England, have reported mass sightings. These sightings are not just the claims of one or two persons seeing something strange in the sky, but fifty to one hundred people clearly identifying unusual flying space craft. Hundreds of people witnessed the Mezcala sighting near Acapulco, Mexico in December 2007 and the appearance of several vehicles over Lima, Peru in May 2007 in the middle of the day. The topic was brought up recently before the Japanese parliament by one of its own officials who urged his country to make a formal statement. The United Nations are rumored to have held its own private sessions on the topic. We believe that all governments are being poised for a greater disclosure. This may be triggered by another mass sighting. Let us realize that many of the current events taking place, from earthquakes to climate change to the release of government information on UFOs, is preparing us all for increasingly dramatic occurances in the future, until we arrive at the moment when we meet our cosmic cousins face-to-face. Remember that discernment and inner preparation are key to our protection and preparation for the wide variety of contact and earth-changing events that the entire humanity of Mother Earth will experience.